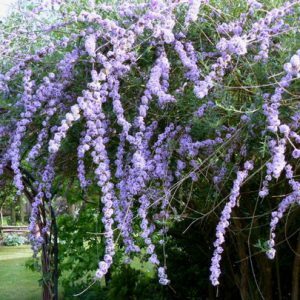 Graceful, arching, weeping silvery foliage and, in early summer, lavender flowers cascade all along the stems like an upside-down mop of purple. It’s fragrant too and, true to its name, butterflies love it. Care: sun to part shade in moist well-drained to well-drained soil. Prune just after blooms finish. Buddleja named to honor Reverend Adam Buddle, Vicar of Farmbridge in Essex and botanist, (1662-1715) Alternifolia means the leaves alternate on the stem. The cultivar’s name ‘Argentea’ means silver due to the tiny hairs on the foliage giving the plant a silvery appearance. ‘Argentea’ selected at Hillier Nursery in England in 1939. 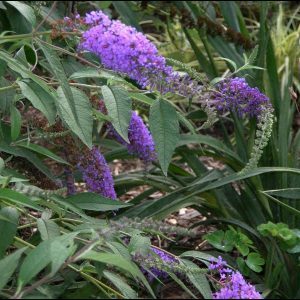 Fragrant, large, lilac to purple arching spikes from summer through fall. Monarch magnet. Very fragrant, large, lilac to purple arching spikes from summer through fall. Monarch magnet. Care: Sun in well-drained soil. Cut it back near the ground in spring. Drought tolerant. First discovered by Pére Armand David, French missionary to China who risked his life in the search for plants during 3 expeditions to China from 1866 – 1872. 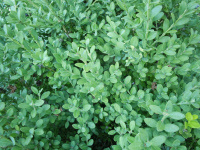 Ernest Henry “Chinese” Wilson found and introduced several cultivars around 1900 popularizing the shrub. Fragrant, honey-scented, large, white, arching spikes from summer through fall. 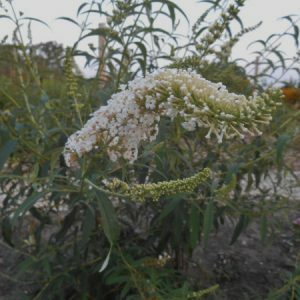 Buddleja named to honor Reverend Adam Buddle, Vicar of Farmbridge in Essex and botanist. (1662-1715) Davidii honors Fr. Armand David a French missionary who noticed it. White flowered variety was described by Ernest Henry “Chinese” Wilson in 1913.